The 175-pound chimpanzee kept as a pet was shot and killed by a police officer after it attacked a woman visiting its owners' home. A Connecticut woman critically injured this week by a rampaging chimpanzee has been transferred to the Cleveland Clinic, which two months ago performed the nation's first face transplant. Hospital spokeswoman Eileen Shiel says 55-year-old Charla Nash is being treated for trauma to her face and lower extremities. The nearly 200-pound chimpanzee was shot and killed by police Monday after it attacked one of Herold's friends, 55-year-old Charla Nash. Nash remained hospitalized Thursday with critical injuries to her face and hands. Her transfer comes as an animal control officer said the rampaging chimpanzee has been the source of safety concerns about the animal several years ago. Lynn DellaBianco said she warned Sandra Herold in 2003 after Herold's pet chimpanzee, Travis, escaped Herold's vehicle and frolicked in downtown Stamford traffic for a few hours. A former city resident now living in Atlanta also says she complained to Herold and police in 1996 when Travis bit her and tried to pull her into a vehicle as she greeted him. DellaBianco, who ran Stamford's animal shelter at the time of the 2003 incident, told NBC's “Today Show'' in an interview aired Thursday that she warned Herold that the pet's mischievous behavior was worrisome. “I did express concern that obviously this could turn into something worse if he really decided to start getting angry and do something,'' DellaBianco said. Authorities have not said whether Herold will face criminal charges. Connecticut state law allowed her to own the 14-year-old chimp as a pet, though several state leaders are calling for tighter restrictions in the wake of Monday's attack. Police are trying to determine why the chimp, a veteran of TV commercials who could dress himself, drink wine from a glass and use the toilet, suddenly attacked. A test for rabies was negative, Stamford police Capt. Richard Conklin said Wednesday. University of Connecticut researchers also performed a necropsy on the chimp, but results aren't expected to be available for several weeks. Leslie Mostel-Paul, a former Stamford resident now living in Atlanta, told the “Today Show'' that the chimp bit her hand when she greeted it as it sat in Herold's vehicle one day in 1996. “I honestly believe if they had followed through, maybe the laws would have been changed sooner and this other woman wouldn't be in the hospital, fighting for her life now,'' Mostel-Paul said. Herold, who raised the chimpanzee from its infancy, has said he was a loving pet whose behavior Monday was completely out of character. She said the chimp combed her hair each night and slept in her bed. “It's a horrible thing, but I'm not a horrible person and he's not a horrible chimp.'' said Herold, who tried to stop the attack by stabbing Travis with a butcher knife and beating him with a shovel. On Wednesday, she disputed police statements that she gave the animal the anti-anxiety drug Xanax shortly before he attacked Nash. However, Herold said in an interview aired Wednesday morning on NBC's “Today'' show that she gave Travis the drug in some tea less than five minutes before he attacked Nash -- she even showed a reporter the mug. Police have said Herold told them that she gave Travis Xanax that had not been prescribed for him earlier on Monday to calm him because he was agitated. Doctors at Stamford Hospital said Wednesday that it took four teams of surgeons more than seven hours to stabilize Nash, 55. Hand specialists, plastic surgeons and specialists in orthopedics, ophthalmology and trauma have treated Nash, who has made slight progress but remained in critical condition, Dr. Kevin Miller said. 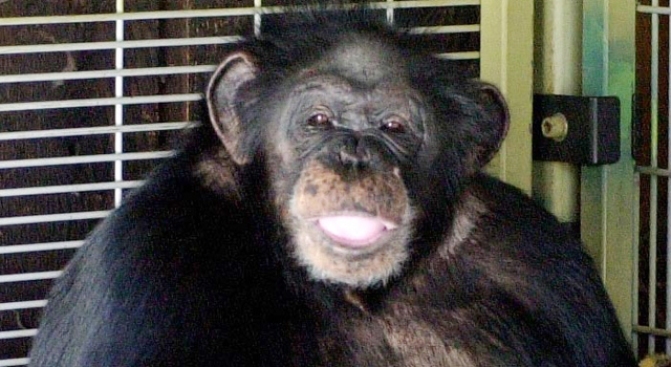 Attorney General Richard Blumenthal said Wednesday that a defect in Connecticut's laws allowed Herold to keep the chimp in her home. There are rules requiring large primates to be registered by the state, but officials have some discretion in enforcing them and violations carry only minor penalties, he said. “She had the toy in front of her. This was just a freak thing,'' Herold said. Travis appeared in TV commercials for Old Navy and Coca-Cola when he was younger, and at home he was treated like a member of the family. Don Mecca, a family friend from Colchester, N.Y., said Herold fed the chimp steak, lobster, ice cream and Italian food.